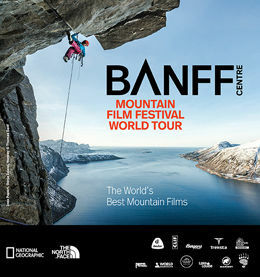 Be part of the Banff Mountain Film Festival World Tour by joining fellow enthusiasts for short films and documentaries about mountain culture, outdoor action sports, nature, and the environment. The films are guaranteed to amaze, inspire and move you. Returning to Traverse City for the 5th straight sell-out year! Online tickets purchased can be picked up at the State Theatre the day of the film beginning at 4 pm. The Afterglow Party following the film fest is at The Franklin. ONLINE TICKET SALES ARE CLOSED. Tickets can still be purchased in person at Oryana, Brick Wheels and Backcountry North. Get your tickets early as every Banff show has been a “sold out” event. If however, you forget to get tickets, be sure to come to the stand-by line on the day of the event. Everyone in the stand-by line has been admitted in past years.